When it comes to home renovation projects it’s hard to decide which project to prioritize, and what will most impact your home value. A recent study reports 86% of home buyers want garage storage space. If you're looking to sell your home anytime soon- your garage is can be the key to standing out. According to Paula Berrera Scheer, a renowned realtor in Miami, “People are really interested [in a home] if they can do other things with their garage, like having half of it for a car and the other half for a workshop. They’re looking for practicality and storage space.” According to Paula, a finished garage is key to having a competitive advantage in a tough housing market. Don’t allow your garage renovation project to start and end with the garage door, that’s only the beginning. What is a “Finished Garage”? When you enter your garage, does it feel like a continuation of your home or a separate piece of the home that has been ignored and shrouded in clutter? A finished garage should blend seamlessly with your home, continuing the style and care you worked to achieve inside the home. Sound overwhelming? Don’t sweat it, we gathered the easiest and best ways to finish your garage, attract home buyers and create freedom from clutter and disorganization. After all, it’s not just your garage- it's your life. Nothing feels colder or less inviting than grey concrete floors. Luckily this is an easy fix! Epoxy flooring can be installed quickly and offers multiple benefits. 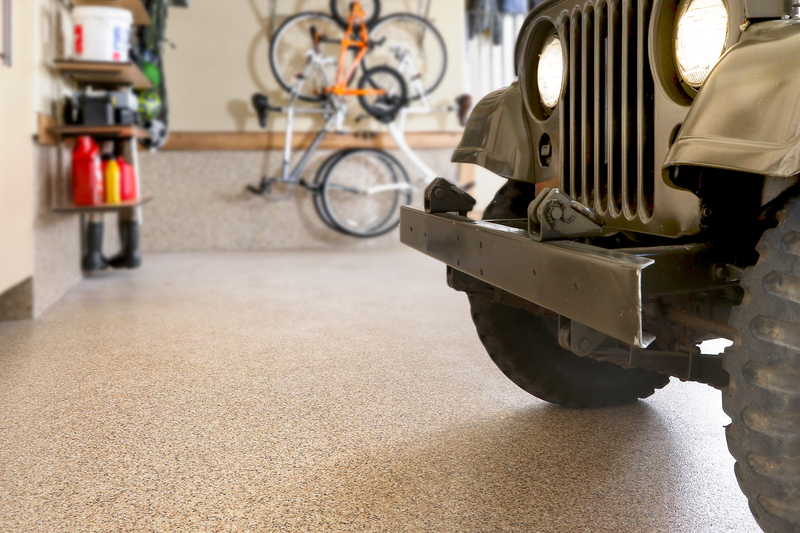 Adding color to your garage only scratches the surface of what an epoxy floor can do for your garage. An epoxy flooring not only protects your concrete from oil stains and chemical spills, but it’s also easy to clean and low-maintenance. Getting this professionally installed guarantees a great warranty and seamless look that adds value to your home. Professional flooring solutions seal the concrete of the garage floor against dirt, dust or other corrosive agents. 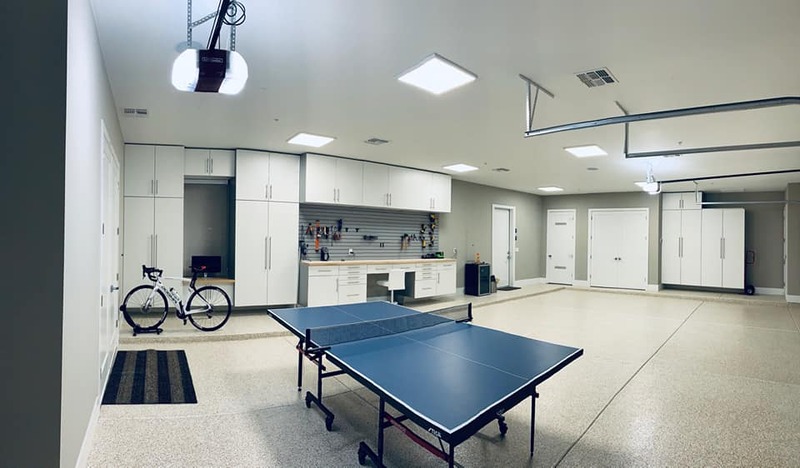 A finished garage floor creates a variety of style possibilities, from coordinated trim to more intricate molding or even board and batten walls. You can learn more about epoxy flooring installation here. You wouldn’t leave plain drywall in your living room without giving it a coat of paint, and neither should your garage! Picking a color that compliments your floors, storage solutions, and even your vehicle will make your garage stand out in the neighborhood. Walls are not the only place to splash some color. Cabinets are a fantastic way to add a colorful aesthetic that can compliment your taste and the rest of your home. 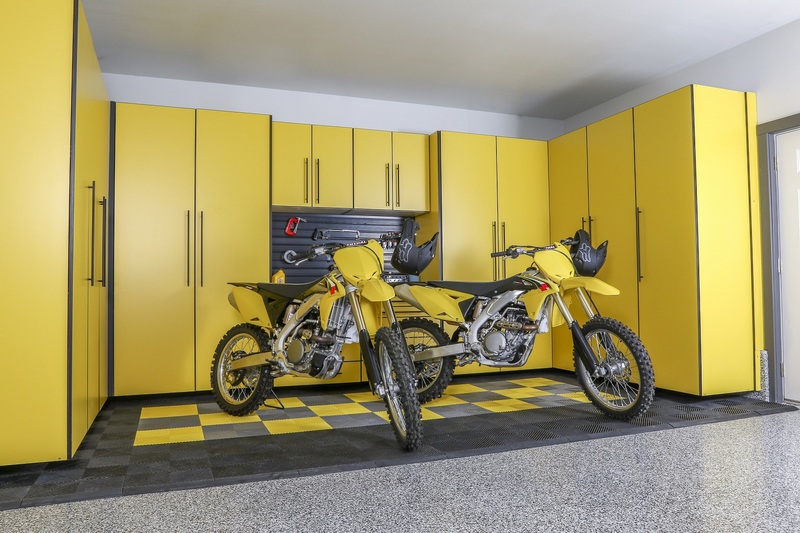 Homeowners often add personality to their garage through artwork and custom floor colors and designs. Have team spirit? Show it off in the garage with custom decals or memorabilia on display! Enhancing your lighting is a great way to showcase and highlight the color you already have. A dim-lit garage shouts “do not enter”- you want the opposite appeal. Now you may be asking yourself “what extra space?”, we specialize in creating space with garage storage solutions. When your garage is organized the extra space can be converted to various forms of workspaces or recreational areas. This adds the feeling of extra square footage -- a massive advantage in today’s job market. In fact, according to HomeAdvisor data, the average cost of converting the garage into a finished room costs an average $11,986 with an 80% return on investment. So, not only does a finished garage provide more living space options, but it also provides substantial growth in home value. Having a designated area for projects or hobbies apart from storage or parking a vehicle is another way to showcase the potential for the space. An in-home gym, workspace, art studio or pantry space are just a few of the options. In-home gyms are all the rage for 2019 home buyers according to Tom Holland, MS, an exercise physiologist from Connecticut, “Home workouts will continue to be popular in the new year. Many Americans are creating home gyms, or using streaming technology to exercise under their own roofs." There's no question, your garage is an extension of your home. The question is, does it feel like it? If your garage is freezing during the winter, of course, it will lack the attention it needs! And there's no reason to add a workbench to a garage that is sweltering in the summer heat. Adding heating and cooling regulation to your garage makes it easy to fully utilize the space year round. This way, your garage space is useful square footage that can be leveraged and converted. Temperature is a big obstacle when it comes to finding garage renovation motivation (no one wants to be uncomfortable while renovating)-- if you’re unable to install heating or cooling consider some temporary options. We found some great resources for heating and cooling your garage, be sure to check out these options. We are loving the new smart garage technology. We listed this in our “9 Garage Trends to Watch in 2019” and can't get enough of the innovations we're seeing. Adding smart garage tech adds to the functionality and convenience of your garage. With smart garage technology, the possibilities are nearly endless. We especially love the smart-tech for the garage door. With the latest in technology, you can monitor your garage door from any location from your smartphone. You won’t have to worry about whether you left your garage door open, or remember a keycode. All you have to do is install a smart hub to your current garage door and download the app to your smartphone, and viola you’re connected to your garage door at all times. Garage tech doesn't stop there. Storage tech solutions add the surprise factor you need to sell your home. 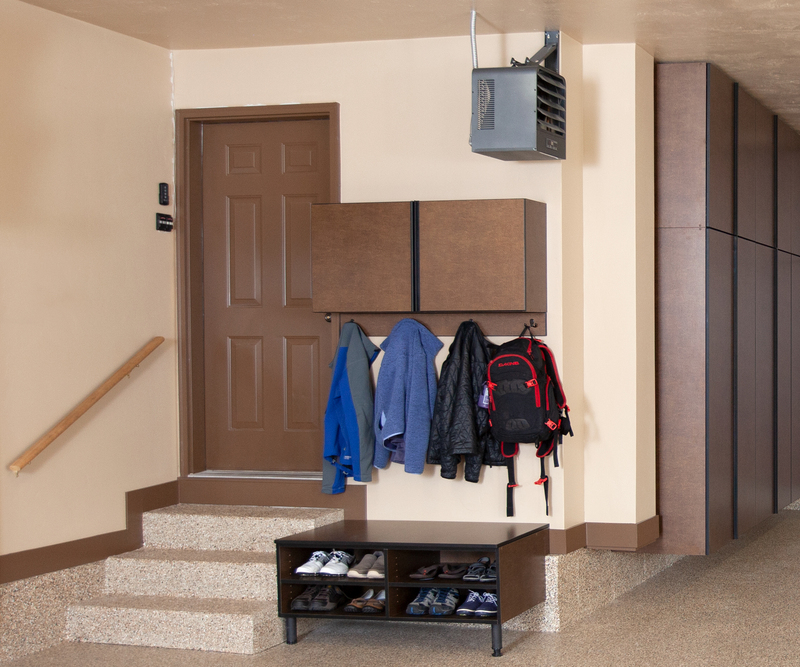 Motorized overhead storage not only gives more storage options but also adds to the tech-savvy home appeal. A simple app on your phone controls the lowering and raising of the storage. Who knew storage could be so smart. Learn more about motorized overhead storage here. How will you Transform your Garage? These renovations are sure to get your garage onto the house tour list with no problem. There's no reason to hide your garage from guests or potential buyers. We want your garage to reach its full potential and be a proud area of the home. What renovations will you complete this year? For more renovation tips, motivation and suggestions follow us on social media or contact a dealer here.